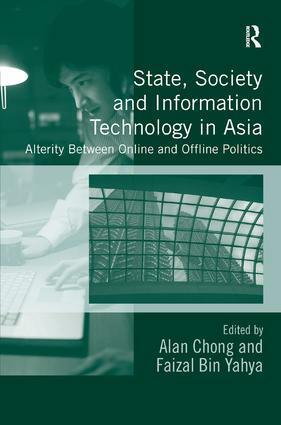 Many maintain that the arrival of computers networked across sovereign borders and physical barriers is a liberating force that will produce a global dialogue of liberal hues but this book argues that this dominant paradigm needs to be supplemented by the perspective of alterity in the impact of Information Technology in different regions. Local experts draw upon a range of Asian cases to demonstrate how alterity, defined here as a condition of privileging the hitherto marginal and subterranean aspects of a capitalist world order through the capabilities of information and communications technologies, offers an alternative to the paradigm of inevitable material advances and political liberalization. Calling attention to the unique social and political uses being made of IT in Asia in the service of offline and online causes predominantly filtered by pre-existing social milieus the contributors examine the multiple dimensions of Asian differences in the sociology and politics of IT and show how present trends suggest that advanced electronic media will not necessarily be embraced in a smooth, unilinear fashion throughout Asia. This book will appeal to any reader interested in the nexus between society and IT in Asia. Alan Chong is Associate Professor at the S. Rajaratnam School of International Studies in Singapore. He has published widely on the notion of soft power and the role of ideas in constructing the international relations of Singapore and Asia. His interest in soft power has also led to inquiry into the sociological and philosophical foundations of international communication. In tandem, he has pursued a fledgling interest in researching cyber security issues. He has frequently been interviewed in the Asian media and consulted in think-tank networks in the region. Faizal Bin Yahya is a Research Fellow at the Institute of Policy Studies, Lee Kuan Yew School of Public Policy, National University of Singapore and his main research interests are on human capital flows, state owned enterprises (SOEs), small and medium enterprises (SMEs) knowledge based industries, regional trade and economic linkages.